Remember I said I was going to test some new hair products? I've completely changed my styling routine, last time I used a volume mousse and a beach look spray. This time I've been trying out a volumizing product (Anti gravity), hair oil (young again), a volume powder called powder puff and last but not least a conditioner for fine colored hair. All from Kevin Murphy, completely organic! You can even use the hair oil as body oil if you want to. The volumizer Anti Gravity gives my hair a sweet scent of lavender. it also gives my hair volume and shine. Curly, thick hair does get dry and unruly. The Young Again hair oil just arrived at my hairdresser RAMM av Ramsvik. It gives me sleek and shiny hair, I apply it to damp hair after the volumiser, and a little more after I blow dry it. After I blow dry my hair with a diffuser, I bend over and carefully dust the back of my head so that the volume powder gets evely distributed. My hairdresser says that it's a common mistake dusting the roots of your hair, it just clogs up! I seek out the volumising products because it boosts my curls to the maximum. These products are also great for adding volume to straight hair. 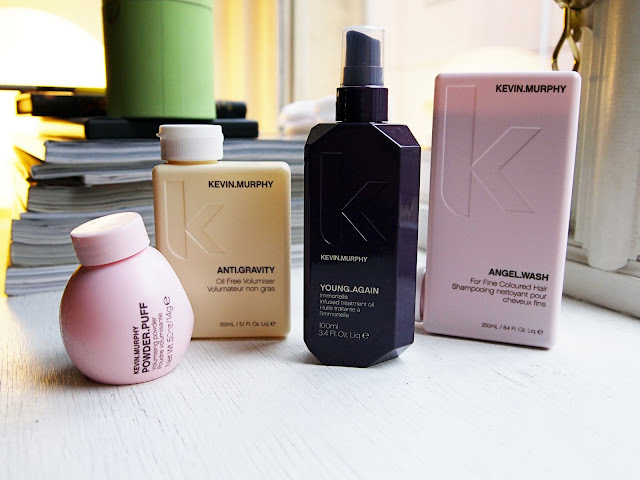 I'm really satisfied with Kevin Murphy's products. Sounds really good, great products! we don't have this brand in Italy... :( otherwise I would try it, also because I love the pack design!